Autumn is soup weather, and I wanted soup when I returned from the farmers market this morning. 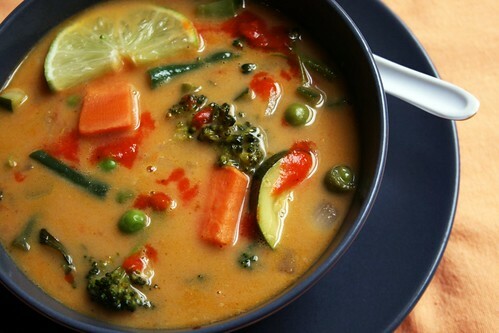 I found myself inspired by Elena's recipe for Thai Vegetable Soup, and although I started making soup with her recipe in mind, in my usual style, I quickly went off the path and made up my own recipe. The whole project sort of took on a life of its own, since I had a bunch of wonderful fresh produce and a jar of red curry paste burning a hole it my pantry. It took hardly any time to throw together and it was absolutely delicious, a fragrant and flavorful soup that is perfect for a chilly fall day. The broth is rich and rather addictive, and makes the soup surprisingly filling. I think I am just going to start making curry coconut broth to have as a satisfying and nourishing beverage on chilly mornings. Although it stood up just fine on its own, my bowl of soup was especially delicious with a swirl of homemade Garlicky Red Chili Hot Sauce. The original recipe is from the New York Times, and I found it by way of Seven Spoons. After reading Tara's amazing description, I knew I had to make it. So I made a big double batch of it last weekend, tweaking a couple things from the original recipe. I roasted the red peppers first to bring out the sweetness, and subbed apple cider vinegar for the white vinegar. It smelled amazing while I made it, then I put in the fridge and let it cure, tasting periodically over the last week. The flavor has developed nicely - it packs a lot of heat, but not the kind that kills your tastebuds. It starts sweet and finishes with a bite in the back of your throat. You feel a little dampness on your forehead. Your lips tingle. You smile. Beyond being delicious, it is also gorgeous - that color is amazing, isn't it?! I used a small amount of fish sauce in the recipe; it can be omitted but does add a very good flavor. Fish sauce contains a nominal amount of sugar, and since I only use 1 tsp in the whole recipe, it is not enough to concern me. However, if this feels to risky for your anti-Candida diet or other sugar avoidance, don't use it. I like Thai Kitchen brand fish sauce, which is certified gluten-free. 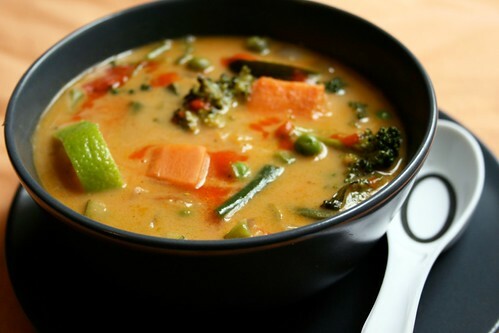 If you desire a more hearty soup, feel free to add diced cooked chicken or turkey, or tofu if you are soy-tolerant. Prepare vegetables as directed above. Heat oil in a large soup kettle, then add garlic and onions and saute over medium heat for 5 minutes. Add sweet potato and saute another 3-5 minutes, then add broth, coconut milk, fish sauce, and curry paste and stir to mix and dissolve. Bring up to a boil, then reduce to a simmer. Once sweet potatoes are almost fully softened, add remaining vegetables and cook about 5 minutes, until broccoli and beans are bright green and just crisp-tender. This will taste best when your veggies are not over-cooked. Remove from heat and serve, garnished as desired. Heat your broiler and line a broil-safe pan with foil. Cut the red peppers in half, remove the seeds, and place skin-side up on the pan, then broil for 5-7 minutes until blackened. Wrap in the foil, or put in a paper bag positioned under a bowl, and let rest for 15-20 minutes. Peel and coarsely chop. 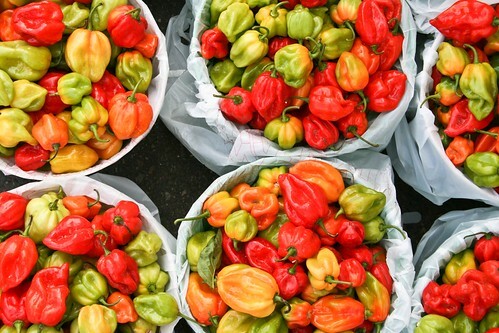 While peppers cool, prepare habañeros. Wearing rubber or latex gloves (no kidding, be sure to wear them), roughly chop the chilis. 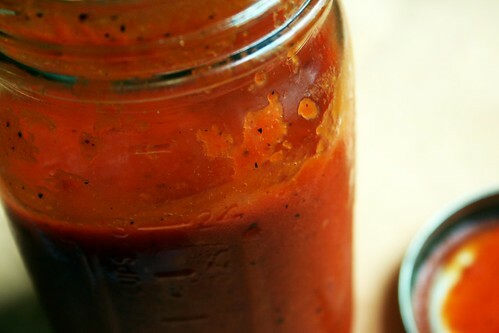 Combine with red peppers, garlic, vinegar, and salt in a small pot over medium-high heat. Once mixture is simmering, reduce heat to low, cover and continue to simmer until peppers are tender, 7 to 10 minutes. Do not inhale vapors; they will sting. Transfer mixture to a blender and purée. Pour into a medium jar and allow to cool uncovered. Cover tightly and refrigerate for three days, then use. 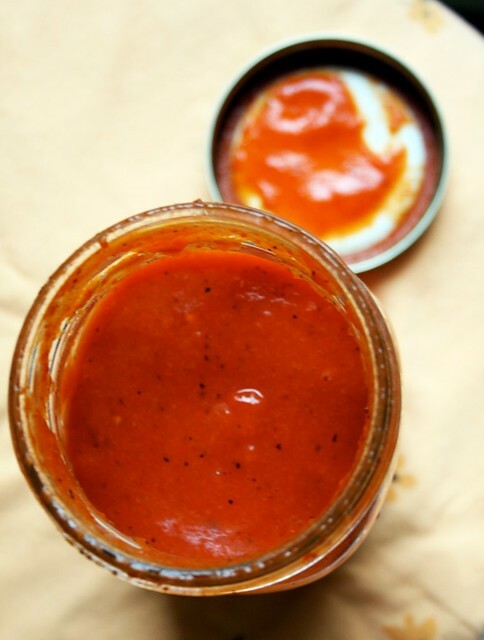 Keep stored in refrigerator; sauce will last for several weeks or months. May SOS Kitchen Challenge Reveal: Spinach! And a recipe for Creamy Spinach & Celeriac Soup.